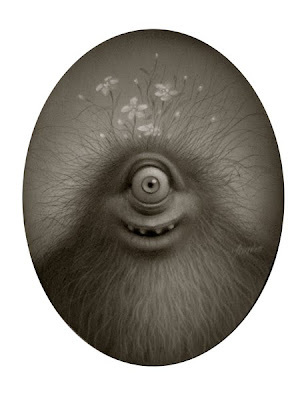 Travis Louie's "Portrait of the Artist as a Young Monster"
The time has come once more for a conversation with the masterful painter Travis Louie, purveyor of fine portraits from imaginary Victorian-era photography studios whose clientele was largely restricted to human oddities and things that go bump in the night. 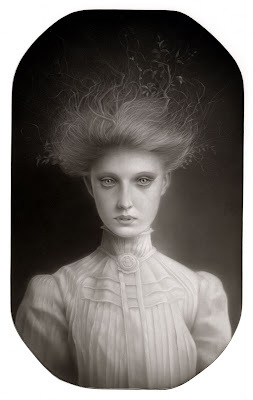 Travis has just released a beautiful little book of his paintings entitled Curiosities, which is designed to look like a turn-of-the-century family photo album. Inside, you will find a selection of the best of Travis' work – displayed much as the lovingly preserved portraits of your ancestors might be – as well as the poignant and amusing stories from which the images are derived. If you find Travis' work compelling, you won't want to miss it... and if you'd like a copy signed in Travis' exquisite handwriting, get in touch with him directly and he'll hook you up. 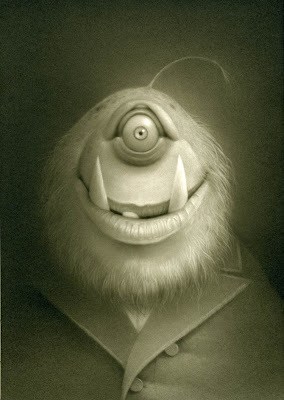 On August 21st at Roq la Rue in Seattle, his exhibition entitled "Portrait of the Artist as a Young Monster" will be unveiled. Despite his demanding schedule, Travis was a dear and eked out some time to ponder my questions about his work. Erratic Phenomena: Tell me a little about your experience of growing up in Queens, immersed in 1950s movies and pulp memorabilia, with their rockets, superheroes and giant monsters. From the way you've described your childhood, it almost seems as if you were raised in an earlier era and somehow time-traveled to ours not too long ago. Travis Louie: I grew up in a neighborhood that was like a time capsule – it was a holdover from the 1950s-‘60s. There was a Woolworth’s with a luncheonette, a drugstore that still had counter service where you could get a chocolate egg cream, a mom and pop toy store, a Chinese restaurant that still had a neon sign that said "Chop Suey," and most important to me, a novelty book store that had a used section with old pulps and comics. I bought old back issues of Famous Monsters of Filmland, old horror comics, Creepy, Eerie, and Mad magazine. There were two great movie theatres in that area, the Prospect Theatre, and at the end of Main Street, a grand movie palace called the RKO Keith's. It was a 3000-seat theatre with a beautiful Spanish-Baroque interior built in 1928. It was fitting that I saw Star Wars, Raiders of the Lost Ark, Jaws, Blade Runner and a revival of The 7th Voyage of Sinbad at those theatres. EP: You've said that as a boy, you drew thousands of sketches of monsters from Atomic Age science fiction and horror movies. I understand it was your grandfather who first noticed your enthusiasm for making images, and nourished that tendency. Could you tell me a little about your relationship with him? TL: My grandfather was a machinist who worked for the Bulova Watch Co. in Astoria. He was a decent draftsman himself and used to draw dinosaurs and elephants for me. He encouraged me to draw what I saw on the big screen – and the little one. He said, "Someone had to design everything you are looking at." He introduced me to those great stop-motion creature features, from King Kong to Jason and the Argonauts. He bought me art supplies and built my first drawing table. I remember when we saw the Ralph Bakshi-animated Lord of the Rings, he asked me to try and remember what I saw and draw it. I drew a really clunky version of Gollum. EP: Is there a particular moment from childhood that stands out for you as an artistic awakening? TL: When my grandfather took me to the Metropolitan Museum of Art, that was an eye-opening experience. I saw the Jules Bastien-Lepage painting of Joan of Arc – it is a remarkable painting that is mostly taken for granted these days. It gave me an understanding of what is possible. To my young eyes, it was even better than those large canvases by Tiepolo that greeted us at the top of the main stairs. I got my first museum headache. EP: As a child, you were fascinated by films like Invasion of the Body Snatchers and Godzilla, which were reflections of the communist paranoia and nuclear anxiety of their era. Likewise, I think your work is in many ways not about monsters at all. The beings you depict are living their lives with as much kindness, dignity and fortitude as one can muster when born with unusual needs and a one-of-a-kind visage, and your humanistic portrayal of them seems to be in part a commentary on the way our society marginalizes the 'other,' fetishizes beauty and rewards uniformity. What do you see as the central metaphor in your work? TL: Mistaken identity… being judged solely on one's appearance… racism. I remember being on a bus with my mom in 1973, and a woman started giving my mom a hard time because of our Southeast Asian appearance. She assumed we were Vietnamese, and insulted us about the conflict in Vietnam and how we didn't belong in her country. My mom always tried to hide such things from us. She felt it was not right to expose us to how ugly ignorance is. The bus driver stepped in and told the lady to pipe down. It played like an awkward moment in a Norman Lear sitcom, but the experience stayed with me. The characters in my paintings are – or can easily be – misunderstood. 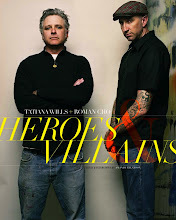 They are, for the most part, kind and affable – just trying to get by, like anyone else. I try to keep it light and maybe humorous. Part of what fascinates me about films like Invasion of the Body Snatchers and Invaders from Mars is the paranoia. I can identify with the character who knows something's going on, but no one believes him. EP: You're a lover of vintage photography – such as ambrotypes, daguerreotypes and albumen silver prints – and you regret that you don't have any such images from your own family. Do you think perhaps your urge to invent ancestral portraits for an imaginary race of misfits might be in part a way to fill a void you feel in your own history? TL: I'd have to say yes. 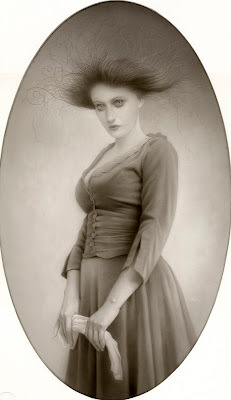 I definitely wish I had old photographs of my ancestors. For a lot of people from that region of the world during the 19th century, that kind of photography was not accessible, or people were afraid of it. 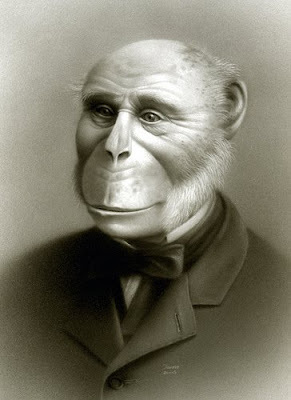 Some of the characters are modeled after real people in my family, like Karl the Humanzee, who is modeled after my grandfather. EP: When you use a real person as a model for a character, what aspect of that person are you attempting to capture? TL: With Karl, I was trying to capture the tired look my grandfather had – my grandmother was very hard on him. He had a great sense of humor and just didn't want to make any waves… but I think it wore him down in the end. Karl's character is very similar. 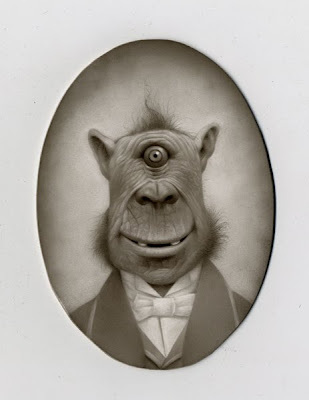 He was discovered working for a rather eccentric, vision-impaired aristocrat in 19th century England and didn't want to interrupt his employer's "perfect world." He never mentioned on his application that he was partly chimp, or ape-like in any way. He just displayed his more human side and followed her wishes. EP: Besides 19th century portrait photography, the most obvious influence in your work is film – and particularly the lighting and atmosphere of German Expressionism and Film Noir. Could you name a few films which could give the viewer a deeper appreciation of your work, and tell me how you feel they've influenced you? 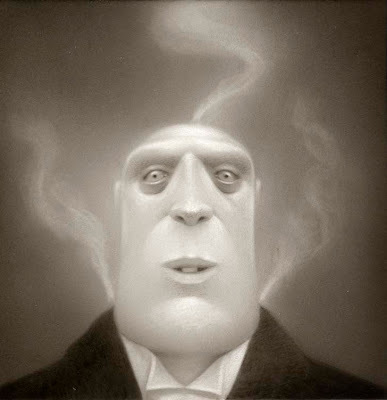 TL: Nosferatu, Metropolis, and Faust come to mind. I don't paint those kinds of backgrounds anymore, but I started out making paintings of chickens and roosters acting out scenes from famous noir pictures like Sudden Fear, Night of the Hunter, Kiss Me Deadly, and The Phantom Lady. It was an earlier influence on the paintings. I still paint in black and white, though. EP: You have a gorgeous hand, and I know that you collect vintage mechanical pencils and other fine writing instruments. Did you learn calligraphy from someone else, or did you teach yourself by studying Victorian penmanship? Does drawing or writing with an antique instrument have a tangible effect on the finished piece, or is it a purely sensual choice on your part? TL: I like the feel of the curvilinear shapes in lettering and fine penmanship. I think it is a sensual thing, as you say. I learned how to have decent, legible handwriting from my 6th grade teacher, Mrs. DiMonica, and I taught myself the more Victorian hand a little later. I have practiced calligraphy on and off since I was in the seventh grade. EP: My favorite amongst all your work is your recent painting of "Molly Bad Hair," who is one of the least 'monstrous' of your characters. It has a palpable tension and vivid emotion, and she's so warm and fleshy and alive that you can almost see her breathe. I wonder if your process in creating her was perhaps a bit different than usual. Do you think you will be exploring more of this sort of territory in the future? How do you see yourself evolving? TL: I'm working on a series of paintings right now that is more in line with the feel of that particular painting. They only thing different about the “Molly Bad Hair” piece was that the model I worked from is a dear friend of mine, so perhaps I had some pressure to make a better painting of her. I plan to expand on my portraiture and make paintings with crowd scenes. EP: You once said, "I arrive at the subject matter for my paintings by writing short stories in my notebooks and making many little thumbnails. The ideas for those little stories come mostly from my dreams." 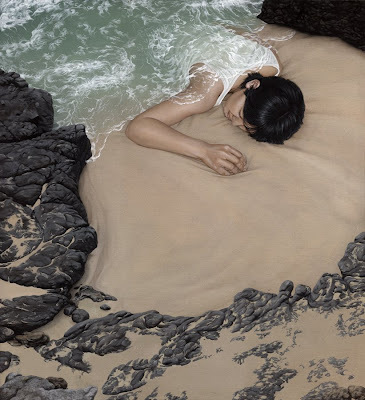 From speaking to a number of pop surrealist painters, I've begun to get the idea that strange, vivid and memorable dreams are a common thread that runs between most of you. Maybe that portal into the unknown that opens for you every night is one of the things that allows you to capture a feeling of wonder in your work. What do you think? TL: I visualize lots of things right before I go to sleep. We all possess our own dream symbolism – it isn't quite as universal as some books on the subject would lead us to believe. I try to decipher my dream symbolism, and those images sometimes linger into my daytime thoughts. When things are going well, I see perfectly arranged, stacked objects. When things are not well, objects appear to be just about to fall or are just haplessly strewn about. As far as the stories go, the ideas usually stem from details within the dreams, like a specific coat, or a broom someone is holding. The dreams can be so lucid and vivid… and always in black and white, too. In a way, it's very therapeutic. 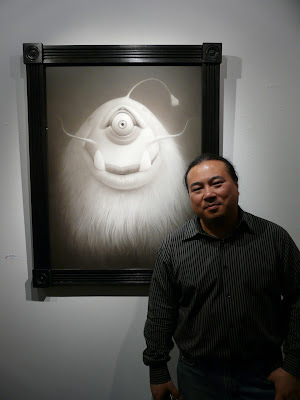 EP: You've been prominent in the pop surrealism scene since you gave up working as a commercial illustrator to pursue making art full-time in 2003. Since then, you've also been nurturing promising young artists who are testing the strange waters of this scene. How has the environment of this corner of the art world changed in the time you've been observing it? Where do you see it going from here? TL: This is a very strange little corner of the art world. I'm not sure where this is all going, but I'd like to see it get some more notoriety, for obvious reasons. I've helped some of my fellow illustrators and a few of the newer artists participate in this scene, with mixed results. 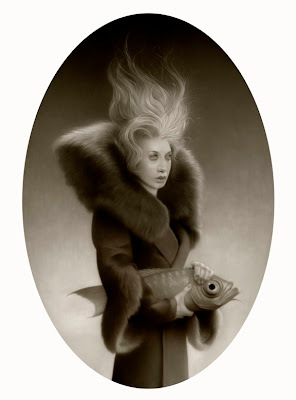 There isn't so much a particular style that defines the scene, but I would say there is a definite flavor to the work that is exhibited that falls somewhere between the decorative and the narrative. Along the way, it continues to morph into something that relates to the ephemera of the artists – how they have been influenced by the pop culture around them. Good or bad, that's the most honest way I can describe this. It continues to attract a larger audience because popular culture is so invasive. Perhaps in 10 years, we'll see where this all goes. EP: The "highbrow" art scene has yet to take pop surrealism seriously, mostly due to the modernist disdain for technical sophistication, emotion and narrative in art – a cult of mediocrity that has marginalized amazingly skilled painters – from Bouguereau to Ryden – for a century. You've decried the fact that most art schools don't even teach students how to draw – let alone paint – anymore. Apparently art critics maintain that critical writing about a new artistic movement should arise out of the scene itself, so that "serious" critics can then draw upon that in order to understand what they're seeing. 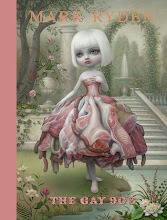 Do you think pop surrealism will ever be legitimized by the high-art world? As today's collectors mature, will art critics also naturally grow out of their 20th-century mindset, and embrace vision and craftsmanship again? TL: I don't know. I always felt that modern art was what they told us it was. Writers of art criticism and art history, perched on the shoulders of others, aping what they've written until the words become gospel and we are expected to hold certain artists to a higher merit and significance, just because they said so. It all seems so political, doesn't it? How does one art community think they are better than another simply because they are different? Let me rephrase that. When you have to go out of your way to put someone else down to make yourself look good, I think we need to question that. In his day, Bouguereau was the most successful painter in France. He was later demonized as an "official" painter, and the art history books had written him out until recently – when prices for his paintings at auction began to reach beyond six figures. It is unfortunate that his popularity made him the focal point of the reaction against academic art that was popular during his day. Don't to get me wrong, there is still beauty in the larger "high art" world, but it seems like we need to dig a little deeper to find it. I think art as a reaction falls somewhere between belligerence and posturing. My art isn't about thumbing my nose at any "establishment." EP: I know you have a deep admiration for Golden Age illustrators Norman Rockwell and Maxfield Parrish, and you've said that close examination of Parrish's glazing method was an influence on the development of your unique painting technique, as well. Tell me about your relationship with their work. TL: I like those two guys for different reasons. As far as Maxfield Parrish goes, I really do enjoy his technique. Knowing about it has been quite helpful – it opens up the possibilities. We’re taught in school that paintings should be painted a certain way – fat over lean, light over dark. But Parrish painted with a glazing method – laying translucent layers of oil paint over each other in a thin wash. If he thought a painting was a little too blue, he would go back and make subtle changes with a transparent glaze of another primary color. I’m interested in the methodology of that. Do I like what he painted? Not as much as I like what Rockwell painted. Rockwell wanted to see. People say his work was saccharine or sentimental, but it wasn’t. He was being honest, because he’d seen that. He had lived through the 1920s, he’d seen the stock market crash. His first wife lost all his money in the stock market, and had been pretty well-to-do, because back then, if you were an illustrator, you were paid really handsomely and you were treated like royalty. Norman Rockwell’s paintings were the first paintings I actually saw. My grandfather had a Rockwell book in his house. The book was from the 1960s, so the reproductions weren’t that great, but I could see how prolific he’d been. I kind of wondered where he found the time. I realized after reading his biography that he had the time because he just worked really hard – he put in many hours per day painting, and he only slept a few hours. His second wife would spend the holiday season trying to drag him out of the studio for the holiday dinner. TL: I really, really like Alfons Mucha and J.C. Leyendecker. Both of them have a wonderful sense of design. Their commercial work was actually quite aesthetically pleasing. Leyendecker was painting more than just an Arrow Collar ad – there was so much more going on. I love the way he used those diagonals. Take a look at those wonderful diagonal strokes. It seems rather obvious why I would like Mucha – for his curvilinear design. 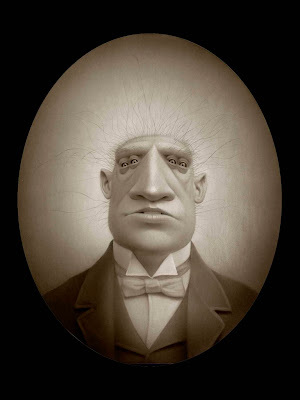 I don’t paint many curvilinear shapes, except in the hair, but I really love his posters. They were just beautiful things. If you’ve ever seen his Slav Epic, those paintings were enormous, and he was never able to exhibit them because they were so big. Dean Cornwell was a wonderful painter – beautiful, beautiful stuff. He was one of Norman Rockwell’s idols. What made his work even more amazing was that back then they had limited color in printing – they were confined to using just two or three colors – and he was able to get away with a lot with limited color like that. I like Howard Chandler Christy, he was a pretty good painter. Of course, you can’t mention the Golden Age of Illustration without mentioning Howard Pyle and N.C. Wyeth. The first Wyeth was the best one... The grandson, Jamie, is living off the fame of his father and grandfather. He’s mediocre at best. Any of the Golden Age illustrators could paint circles around him. I like Robert McGinnis. He did pulp covers and movie posters, like the old James Bond posters. Most recently he’s been doing western paintings, beautiful paintings that are like a mix of a John Wayne movie with an old silent William S. Hart movie. Then of course there’s Frank Frazetta. I was much younger when I first saw his work, but I’m not sure I’d be doing what I’m doing now if not for him. I like his work ethic. Here’s a guy who made it look easy. He actually did some of those paintings in an evening, and sometimes I feel like I’m emulating him when I try to do a painting overnight, which is something that happens to every illustrator, and has happened to me many times. I love the pressure. It seems like a crazy thing, but I really do love it. I thrive on it. While I'm doing it I don't enjoy it so much, but when I'm done there's a sigh of relief. It's like that scene in Misery, when James Caan finishes writing his novel, and he lays out a cigarette, a match and a glass of champagne – it's a ritual thing. When I'm done with a painting, I like to go for a walk. I like to bask in the enjoyment of, "Hey, look, I just finished this thing." I guess other artists must do that too... I can't be the only one that does that. TL: Théodore Gericault’s “The Raft of the Medusa.” It’s a beautiful painting, there’s this energy, and it’s historical. A good genre painting will give you a sense of when it was painted, not necessarily just the clothes that people were wearing, but the political climate, too. It’s marvelous. EP: What else are you looking forward to right now? Hopes, dreams, plans for the future? TL: A break! My big plan for right now is to get past this show and have a break. In the future, I plan on doing larger scale paintings that have more things going on in them. I want to do a painting of a court hearing, or the closing of a large business deal that would have all these unusual characters sitting around a boardroom table. An expansion of what I’m doing to the next level. I’m not going to do any kind of crazy experimentation with my paintings. I’m going to change them very incrementally. 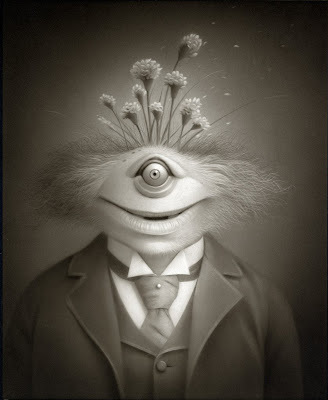 Travis Louie's "Portrait of the Artist As a Young Monster" will open on August 21st at Roq la Rue in Seattle. 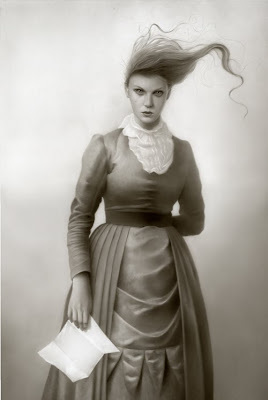 Along with a few monsters and human oddities, this show will feature a number of Travis' beautiful but strange (and sometimes a bit demented) Victorian ladies. 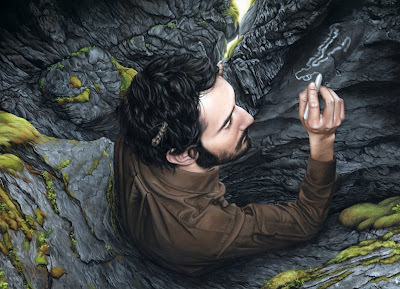 Keep an eye out for a gorgeous print of Travis' painting "Sarah and Emmet," which is forthcoming from Pressure Printing... and don't forget to check out Curiosities. 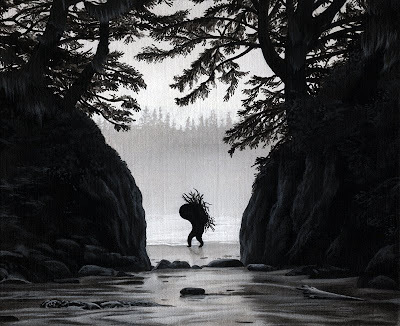 As I've been searching the world of art for that ineffable, transcendental quality that is so elusive, I have returned again and again to the work of Moki, whose paintings often depict lonely northern places – frozen lakes, mysterious caves and rocky tundra swept by damp, bitter winds that carve the landscape into evocative, almost anatomical forms. She once said, "I am looking for places that are good for hiding, where you feel secure and safe, where you can disappear or return home. 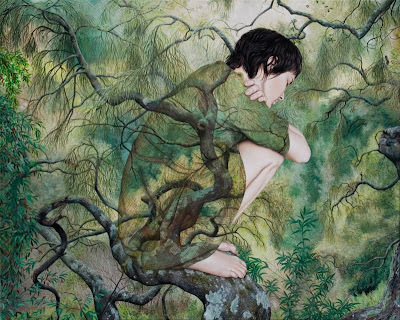 Where you can be invisible." In this remoteness dwell strange beings – part spirit, part animal, part earth, and perhaps also composed of something stranger... something that comes from the sky, or from another plane of existence. 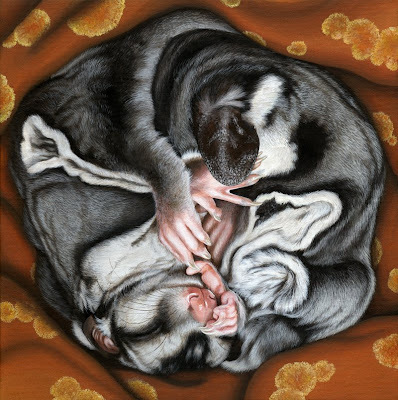 In her most recent work, Moki has begun to paint remarkably realistic depictions of people existing within these unearthly landscapes in various states of corporeality, as if they are subject to a surreal sort of dream logic. Eyes averted, they are oblivious to our presence – either lost in an internal reverie or in the throes of being overcome by the potency of their surroundings. 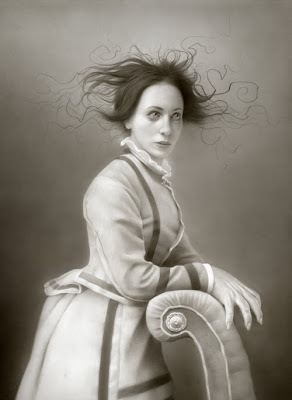 While she considers herself primarily a painter, Moki also works in comics, photography, animation and sculpture. 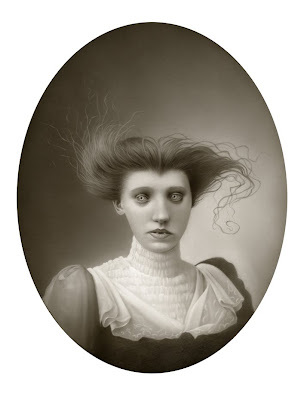 She currently lives in Hamburg and is working toward a graduate degree at the Academy of Fine Arts there. 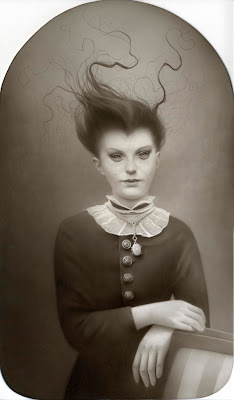 Her first American solo show, "Bunker Underground," opens on August 6th at Jack Fischer Gallery in San Francisco. Fortunately she was brave enough to overcome her concerns about our language barrier and share some insight into her work with me. Erratic Phenomena: Tell me about your childhood in a the rural village of Brilon, Germany. You were surrounded by two nature preserves as a child, so that must be where you developed your intimate, almost mystical relationship with the landscape. 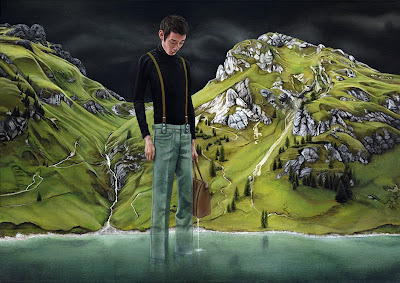 Moki: I grew up in a very small village in the middle of Germany. It's surrounded by rolling hills and woods – woods so big that you can easily get lost when you take the wrong turn. Certainly many places there are connected with special memories. For example, there is a red creek crossed by little bridges somewhere in the forest. It looks really strange – maybe the color is caused by iron in the ground. There are narrow valleys which are interesting for mushroom collecting – once I found a really big porcino. One hill there is called "Sonder,” which is Low German for sunnenland – "land of the suns." It's a heather-clad nature preserve with blueberries and some good places for hiding. It's a spot with a wonderful view! Regarding landscape – in my pictures, I find ways to integrate large-scale human beings. Often they are as huge as giants in contrast to the landscape. As a child, I often thought about being very huge, being able to see everything from above. I imagined things like a giant sitting in the hayfield next to our house – so tall that his head was in the clouds – or I would lie in my bed and feel as tiny as an ant. My little brother told me that he imagines driving over the hills in a car that has huge balloon tires. Growing up in the countryside, taming cats, building tree houses and playing in the woods makes me aware of how small I am, and how amazing it is to be alive. In my pictures, there are many unconscious influences that I don’t try to control. I work from intuition, because for me that seems to be more interesting than illustrating an idea. There is no message expressible in words, and no need to interpret… although I’ve discovered many things about what I do. When people tell me what's going on in my paintings, I'm excited about their feelings and ideas! EP: Was anyone in your family an artist? Moki: My father used to paint when he was young. He is a passionate musician, and has had a band for many years now. My brothers and I were lucky, because we were able to try out several musical instruments. I’d like to be professional drummer by the time I’m 70! EP: When did you first realize that you had something unique to say with your vision of the world? Moki: I guess around the age of four or five, I decided to cancel my career as opera singer to be painter. When I was sitting in my room drawing something, I was totally absorbed. In Germany, people call this state of consciousness "flow." That absence of distraction is hard to find – that's why I can work best late at night. EP: Many of your landscape paintings have a Northern romantic sensibility – with unspoiled tundra and rocks scoured clean by glaciers, reminiscent of a remote area of Iceland or some mythical subarctic continent. Do you consider these environments to be animistic visions of real places, or do you see them as existing in another reality altogether? EP: Like the great Russian abstract painter Wassily Kandinsky, you are synesthetic – you experience music as colors and shapes, and abstractions like numbers and days of the week have their own color and tone. Kandinsky said, "Color is a power which directly influences the soul. Color is the keyboard, the eyes are the hammer, the soul is the strings. The artist is the hand that plays, touching one key or another, to cause vibrations in the soul." How does having this "sixth sense" of synesthesia affect or enhance your work? 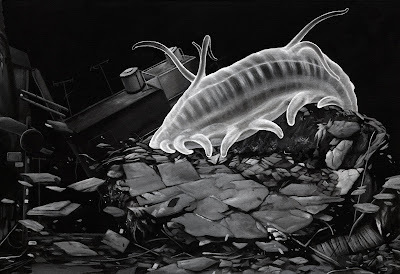 Moki: It has a bigger influence on my understanding of the world than on my work. Like many, I have strong emotions when I get into music – with these colors and shapes moving inside my head, it's overwhelming. I suffer from the impossibility of sharing this with other people. I once made an animation film trying to translate this perception, but I failed. The experience of sensing something that other beings cannot see or feel makes me so interested in the ideas of constructivist epistemology. At the same time, it shows me how difficult and important it is to communicate – to share the world inside our heads, our dreams. EP: Why do you choose not to title your paintings? 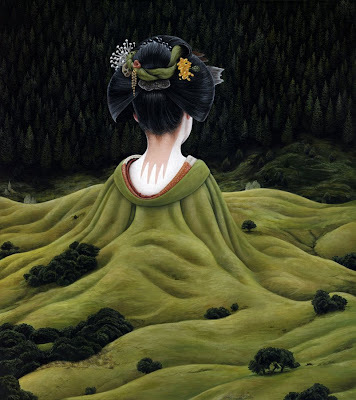 Moki: A title is like a filter. I want the viewer to look without this little guide. The thoughts you get when looking at a picture reflect your own personality. When I have to find a title for a show, I sometimes use a phrase from a song I like. EP: I understand that you consider yourself to be much more influenced by literature than art – notably the novels of Haruki Murakami, author of Kafka On the Shore, who writes visionary novels of alienation and romantic love, and the stories of the legendary Russian science fiction writers Arkady and Boris Strugastky. Your work particularly reminds me of the Strugaskys' bleak, atmospheric Roadside Picnic, which describes the inexplicable aftermath of a mysterious alien visitation which the human mind is too primitive to comprehend. Tell me what inspirations you find in these literary sources. 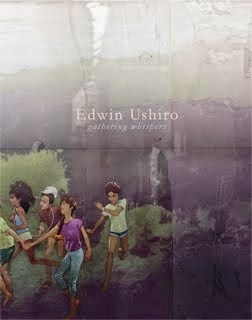 Moki: I think one aspect these two books have in common is the implicit supposition that the world is a treasure trove. The rare moments of insight when you realize how crazy it is to be alive, to have all these other feeling beings around you – sitting in a well, living in a library or making a detour to come faster to the destination. 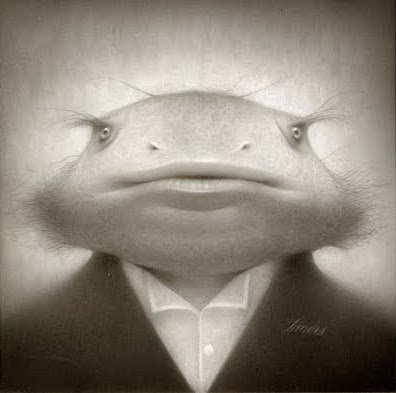 I enjoy the pictures these authors evoke, the surrealistic elements – metaphorical or not. EP: Another major influence on your work is Japanese animation director Hayao Miyazaki, whose films such as Princess Mononoke and Spirited Away resonate with a concern for the environment, which manifests itself in the suffering of earth spirits which have been ripped from the natural landscape they exist to inhabit and protect. Some of the ethereal and concealed beings that you depict in your paintings appear to have a similar origin, as elemental spirits emerging from and bound to the natural world. Tell me why you find these ideas so compelling. Moki: In contrast to the ideas of western civilization, I cannot find a separation between "good" and "bad" in these examples of Asian culture. For instance, in the film Princess Mononoke, the central characters are both good and bad at the same time, depending on one’s point of view. I think this is a holistic approach, which establishes a better understanding and sympathy for the actions of other people, as well as for my own behavior. Hayao Miyazaki invents wonderful creatures! I like Totoro and the little black dust men, the tree phantoms and many more. Sometimes you don't know if something is a walking plant or an animal... großartig! EP: What are you looking forward to right now? Hopes, dreams, plans for the future? 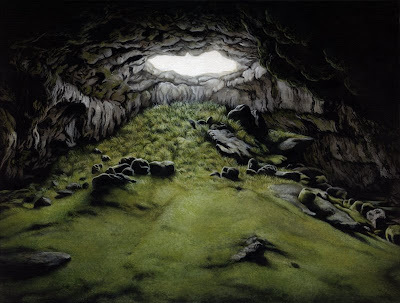 Moki: I will publish a book of my paintings at the end of this year. In general, I would like to do some more films and interactive stuff. I would like to try a different style of painting, focusing on the lines. I also plan to draw a longer comic. 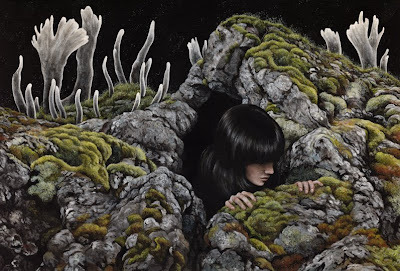 Moki's "Bunker Underground" opens on August 6th at Jack Fischer Gallery in San Francisco. 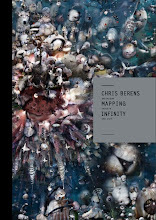 She also has a gorgeous print for sale at Nucleus Gallery and an exhibition catalog available from Heliumcowboy. "He had never experienced anything like this before. It was as though he were in a different world. 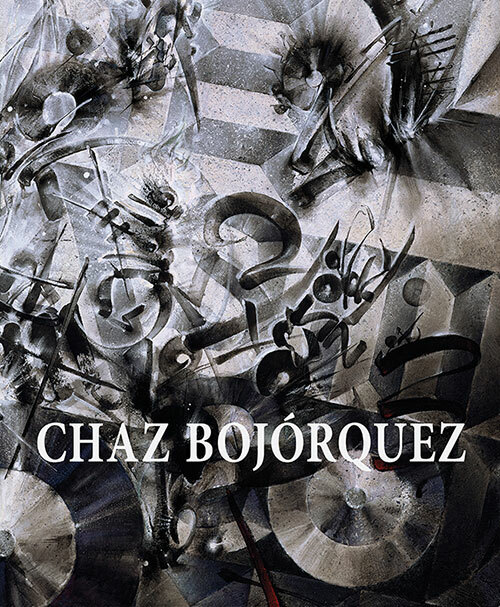 A million odors cascaded in on him at once – sharp, sweet, metallic, gentle, dangerous ones, as crude as cobblestones, as delicate and complex as watch mechanisms, as huge as a house and as tiny as a dust particle. The air became hard, it developed edges, surfaces, and corners, like space was filled with huge, stiff balloons, slippery pyramids, gigantic prickly crystals, and he had to push his way through it all, making his way in a dream through a junk store stuffed with ancient ugly furniture... It lasted a second. He opened his eyes, and everything was gone. It hadn’t been a different world – it was this world turning a new, unknown side to him. This side was revealed to him for a second and then disappeared, before he had time to figure it out."